The Whittley CR 2600 is called a cruiser, but it could also be a beach shack or caravan on other occasions; or all three on the same holiday. It provides comfortable sleeping for four, has a bathroom, kitchen and dining space. A useful feature for a powered caravan site is a built-in battery charger. Plug in and no worries about flattening the batteries. But on the review day we just tested it as a boat. It was a fairly rugged sort of day – not ideal for a gentle family day afloat but the kind of conditions to show up any marine shortcomings. Not that we were likely to find any: these hulls, with the sharp deadrise for cruisers of 19 degrees, have been performing without complaint for a good many years. A lot of time must have been spent by the Whittley design team at the drawing board, and probably constructing models as well, to make the most of the 2600’s internal volume. Whittley has achieved the neat trick of giving a boat that is almost entirely devoted to accommodation an airy and open feel. Part of this, of course, is removable clear screens aft instead of a bulkhead. A sliding clear roof panel and sliding side glass help too. But basic good design has created an interior capable of absorbing large amounts of stuff but without being at all cluttered. No potential storage spot has been overlooked: under deck, behind linings, within or below built-in furniture. Many of these compartments are special purpose: the dual driver’s seat, for example, contains specialised stowage for bottles and glasses; the rear lounge’s headpiece raises to expose to the rear platform an ice tray for drinks or bait. That boarding platform is an important part of the social space, and fitting guard rails has made it especially useful. 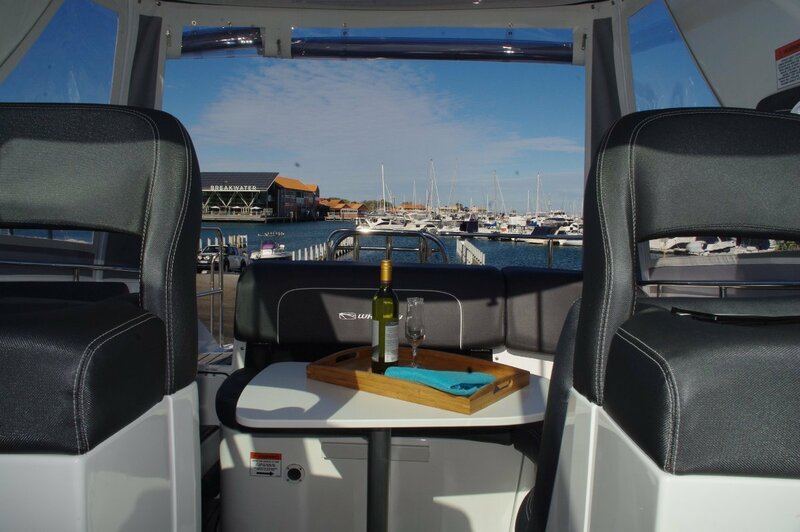 It is big enough to take chairs for sundowners or a couple of anglers, and offers the opportunity of fitting a barbecue. Within the thickness of the platform is yet another storage compartment. Effectively there are two bedrooms. The fore cabin, with standing headroom, has V-berths and also contains the galley. Effective, though necessarily small, it has a single burner stove, a sink, a refrigerator and surprising quantities of cupboards. The bathroom occupies a separate compartment neatly fitted out with wash basin shower and flushing toilet. The second bedroom is a simple night time conversion of the dinette into a double bed. 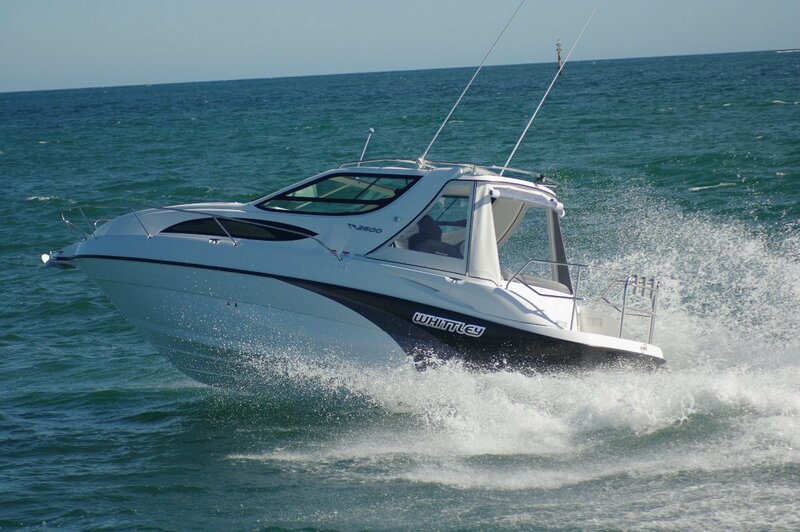 Power came from the new 200hp Volvo Penta with an aluminium block and closed circuit fresh water cooling. 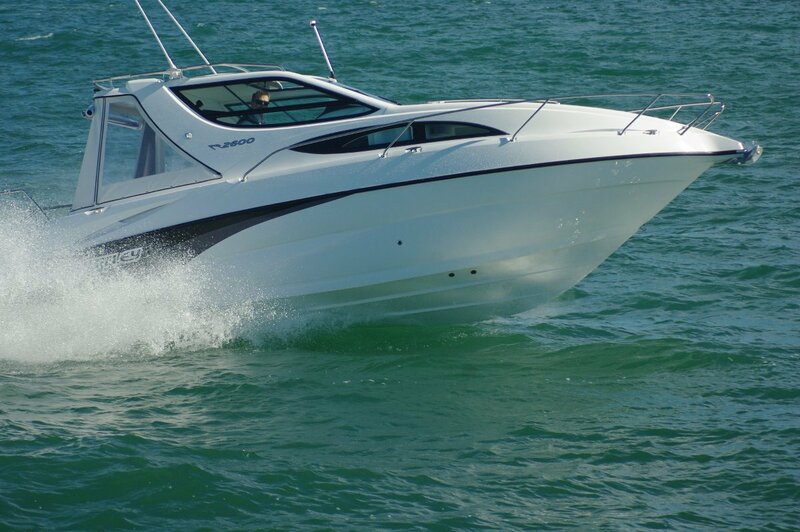 The 2600 can take up to 320hp, but our modest power took us up into the 20s of knots and seemed to fit the boat’s role well. Certainly, there was enough urge to cope with anything the sea wanted to do with us. The driver’s seat is mounted high. This allows good vision through the windscreen, but for even better vision you open the roof and stand up. In either pose this is a comfortable boat to drive. 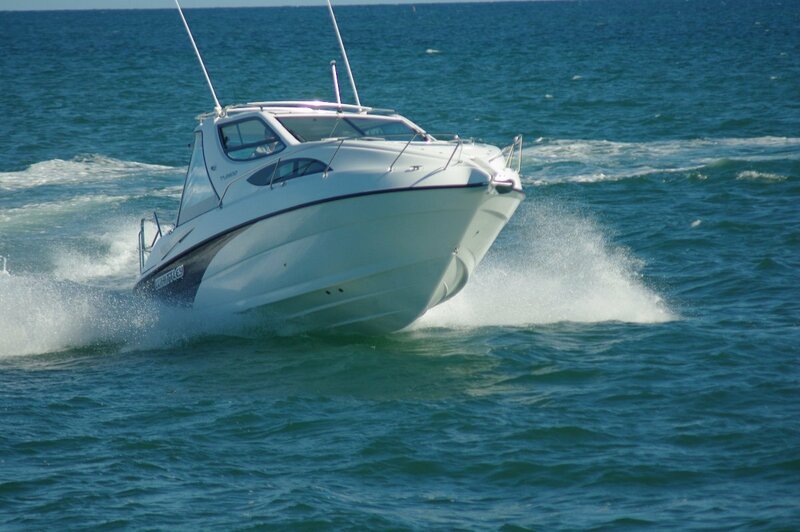 Our boat was equipped with Zipwake automatic interceptor type trim tabs, intended to iron out pitch and roll motion. Some other manufacturers’ examples have been disappointingly slow in their responses, but this system made a useful contribution. On big alterations of course, for instance, the trim compensated for the different effect of the sea. A handy item on a cruising boat where the skill levels of some family members might not be great. Some boats are just called cruisers; this actually is one.